In the complement system, the regulators of complement activation (RCA) play crucial roles in controlling excessive complement activation and in protecting host cell from misdirected attack of complement. Several members of RCA family have been cloned from cyclostome and bony fish species and classified into soluble and membrane-bound type as in mammalian RCA factors. Complement-regulatory functions have been described only for soluble RCA of lamprey and barred sand bass; however, little is known on the biological function of the membrane-bound RCA proteins in the lower vertebrates. In this study, a membrane-bound RCA protein, designated teleost complement-regulatory membrane protein (Tecrem), was cloned and characterized for its complement-regulatory roles. Carp Tecrem, an ortholog of a zebrafish type 2 RCA, ZCR1, consists of four short consensus repeat modules, a serine/threonine/proline-rich domain, a transmembrane region, and a cytoplasmic domain, from the N terminus, as does mammalian CD46. Tecrem showed a ubiquitous mRNA expression in carp tissues, agreeing well with the putative regulatory role in complement activation. A recombinant Chinese hamster ovary cell line bearing carp Tecrem showed a significantly higher tolerance against lytic activity of carp complement and less deposition of C3-S, the major C3 isotypes acting on the target cell, than control Chinese hamster ovary (mock transfectant). Anti-Tecrem mAb enhanced the depositions of carp C3 and two C4 isotypes on autologous erythrocytes. Thus, the present findings provide the evidence of complement regulation by a membrane-bound group 2 RCA in bony fish, implying the host–cell protection is an evolutionarily conserved mechanism in regulation of the complement system. Complement system is one of humoral innate immune factors that play a main role in tagging and killing of microbe invaders, as well as modulation of inflammatory and adaptive immune responses (1, 2). Three distinct activation cascades with different mechanisms in pathogen sensing trigger the complement activation, as follows: the classical, lectin, and alternative pathways. These proteolytic cascades form two types of enzyme complexes, or C3 convertases (C3bBb and C4b2a), to cleave C3 into biologically active fragments, C3a and C3b. Although C3a induces inflammatory anaphylatoxic responses, C3b can covalently bind target microbes, playing a role as a tag for opsonization and as an anchor for C5 convertase, which triggers formation of the cytotoxic membrane-attack complex. These potent physiological activities are crucial for effective pathogen elimination, but may potentially cause damage of host cells in case of excessive or misdirected activation, resulting in allergic or autoimmune pathology (1, 3–6). The activation of C3 is therefore tightly controlled by a redundant set of regulatory factors, such as members of the regulator of complement activation (RCA) protein family. RCA proteins are characterized by their modular architecture consisting of the multiple copies of short consensus repeat (SCR) modules, each of which is composed of ∼60-aa residues containing typical distribution of four Cys residues and some other consensus residues (1, 7, 8). In humans, secreted RCA proteins such as factor H and C4-binding protein (C4bp) and membrane-bound proteins including membrane-cofactor protein (MCP or CD46), decay-accelerating factor (DAF or CD55), and complement receptors type 1 and 2 (CR1 or CD35, and CR2 or CD21) have been identified (8). Their modes of action are categorized into two, as follows: decay acceleration of C3 convertase complex and degradation of C3b/C4b fragments as cofactor of the degradation protease, or factor I (8). CR1/CD35 acts as a regulator in both modes and also as a receptor to mediate phagocytosis (9) and immune adherence (10–12), whereas CR2/CD21 functions as a C3d receptor with no regulatory role in the complement activation (8). In addition to the roles in innate immunity, some membrane-bound RCA, MCP/CD46 and CR2/CD21, have been recognized as mediators of adaptive immune responses, affecting Th1/Th2 balance, Ag presentation, and B cell activation in mammals (13–18). Phylogenetically, genes encoding the RCA proteins are classified into two groups, as follows: group 1 composed of factor H and its related factors, and group 2 containing the others in the human RCA members (19). Loci of each group form a compact cluster, and, in the human genome, the group 1 cluster and the group 2 loci are also located in proximity, forming a RCA gene cluster (20–22). Genomic arrangement of the RCA genes and their clustering are diverse among species analyzed to date, such as mice (23, 24), chicken (25, 26), frog (27), and teleost, which is the most common group of the ray-finned bony fish (28–34). In a functional point of view, the secreted RCAs are considered to control excessive complement activation on target surface, whereas the membrane-bound RCAs should protect host cells from misdirected complement attack. Both are in combination essential to prevent autoimmune damages of bystander host tissues from the anaphylatoxic and cytotoxic attack by the complement (1). Phylogenetic and genomic lines of evidence have indicated that RCA had emerged in cyclostome, the most ancient class of vertebrate (35), and that bony fish are equipped with both group 1 and group 2 RCAs, because factor H–like secreted RCAs and membrane-bound RCAs have been found in zebrafish genome (33, 34). As for function of RCA in the lower vertebrates, regulatory roles in deposition of C3 and degradation of C3b/C4b have been described only for secreted RCAs in lamprey (35) and barred sand bass (28–30). No functional data, in contrast, have been reported for membrane-bound RCA protein in any lower vertebrate species. The present study has aimed at obtaining functional data for complement-regulatory roles of membrane-bound RCA molecule at both mRNA and protein levels. Molecular cloning of membrane-bound RCA, designated teleost complement-regulatory membrane protein (Tecrem), from zebrafish and carp, tissue distribution of Tecrem mRNA, recombinant Tecrem expression on Chinese hamster ovary (CHO) cells, and functional assay using the Tecrem-bearing CHO have gained a line of evidence that Tecrem is expressed ubiquitously in fish tissues playing a protective role from possible host damage by complement. Mouse IgG1 mAb (AD1.1.10) conjugated with FITC against 6×His tag was purchased from Abcam. Zebrafish were provided by Y. Yoshiura (National Research Institute of Aquaculture, Fisheries Research Agency, Mie, Japan) and kept at 27°C fed with commercial diets. Common carp (Cyprinus carpio) weighing 0.2–1 kg was purchased from a local fish farm. Carp serum was isolated, as described previously (36). Ginbuna crucian carp (Carassius auratus langsdorfii, S3N strain), a close relative species of the common carp, weighing ∼50 g, has been maintained in our laboratory, as described elsewhere (37). CHO cells were a gift of H. Tachibana (Department of Bioscience and Biotechnology, Kyushu University) and were maintained in Ham’s F12 medium supplemented with 10% FBS. KF-1 cells (Koi carp fin cell line) were maintained in MEM supplemented with 2 mM glutamine, 14 mM HEPES, and 10% FBS at 20°C in 5% CO2. CHO cells (1.0 × 107) were collected in 10 mM EDTA in PBS, washed with PBS three times, and suspended in 1 ml PBS. Then the CHO suspension was emulsified in 1 ml CFA and i.p. injected into carp six times at weekly intervals. Next, the carp was bled to separate antiserum. Anti-CHO carp IgM was purified from the antiserum by gel filtration on a Superdex 200 pg column (1.6 × 60 cm) equilibrated with 2.5 mM veronal-buffered isotonic saline (pH 7.4) containing 2.5% glucose, and stored at −80°C until use. Carp erythrocytes were separated from heparinized blood, suspended in PBS at 1.0 × 107 cells/ml, and i.p. injected into ginbuna crucian carp four times at weekly intervals at a dose of 0.5 ml suspension/100 g body weight. The fish were bled 7 d after the last injection, and the sera separated were heat inactivated at 50°C for 20 min. Sera from three fish, showing agglutination titer of >128 against carp erythrocytes, were pooled and stored at −80°C until use. TBLASTN searches of Zebrafish genome database (http://www.ncbi.nlm.nih.gov/projects/genome/guide/zebrafish/) were conducted using amino acid sequence of the human CR1/CD35, CR2/CD21, factor H, DAF/CD55, MCP/CD46, and C4bp (α-chain and β-chain). Intron–exon organization was predicted using Softberry program (http://www.softberry.com/berry.phtml). Various organs (intestine, gill, kidney, spleen, hepatopancreas, brain, skin, muscle, and heart) were isolated from the common carp and zebrafish. Total RNA was extracted from the organs using ISOGEN reagent (Nippon Gene, Tokyo, Japan), according to the manufacturer's instructions, and 1 μg RNA was reverse transcribed using Moloney murine leukemia virus reverse transcriptase (Invitrogen, Life Technologies, Carlsbad, CA) and oligo-dT primer. The first-strand cDNA was used as template for expression analysis. Gene-specific primers (Table I) for 5′- and 3′-RACE, designed according to the coding sequence of zebrafish Tecrem (zTecrem) predicted from the database, were used for RACE PCR, using SMART RACE cDNA Amplification Kit (Clontech, Tokyo, Japan) and first-strand cDNA synthesized from total RNA mixture from the intestine, gill, kidney, gonad, spleen, hepatopancreas, brain, skin, muscle, and heart. Nested PCR amplifications were performed using Phusion DNA polymerase (New England Biolab, Tokyo, Japan) under the following conditions: for first 3′-RACE, 30 cycles of 98°C for 10 s, 65°C for 30 s, and 72°C for 1.5 min; for nested 3′-RACE, 30 cycles of 98°C for 10 s, 60°C for 20 s, and 72°C for 1.5 min; for first 5′-RACE, 30 cycles of 98°C for 10 s, 55°C for 30 s, and 72°C for 1.5 min; and nested 5′-RACE, 30 cycles of 98°C for 10 s, 60°C for 20 s, and 72°C for 1.5 min. The final amplified products were subcloned into pGEM-T vector (Promega, Madison, WI). More than five clones were independently sequenced on both strands to correct possible PCR errors, using CEQ8800 DNA Analysis system and Dye terminator cycle sequencing kit (Beckman Coulter, Tokyo, Japan). RACE PCR of carp Tecrem (cTecrem) was performed similarly but using primers based on a carp expressed sequence tag (accession number EH649440) homologous to zTecrem, and sequenced essentially as above. Genomic DNA (10 μg), isolated from carp erythrocytes according to a standard procedure, was digested to completion at 37°C for 16 h with 100 U PstI (New England Biolab, Tokyo, Japan) and electrophoresed on a 1% agarose gel. The DNA fragments were transferred to a Hybond N+ membrane and hybridized with digoxigenin-labeled cDNA probe specific for cTecrem, detected using chemiluminescent substrate of alkaline phosphatase, closely, as described previously (38). Expression sites of Tecrem were analyzed by RT-PCR with primers GSP2 and GSP3 for zebrafish and GSP9 and GSP10 for carp (Table I). Zebrafish GAPDH and carp 40S ribosomal protein S11 subunit cDNA served as a positive control for respective species (Table I). After reverse transcription from the total RNA with Moloney murine leukemia virus reverse transcriptase and oligo-dT primer, PCRs were performed under the following conditions: initial denaturation for 2 min at 94°C and 30 cycles of 94°C for 30 s, 55°C for 30 s, and 72°C for 1 min, followed by a final extension at 72°C for 2 min. The amplified products were run on a 2% agarose gel and stained with 0.5 μg/ml ethidium bromide. cDNA fragments encoding from SCR3 to 3′-UT of zTecrem were amplified from various tissues as above and subcloned into pGEM-T vector. Resultant clones containing inserts with four different lengths, ranging from ∼770 to ∼900 bp, were sequenced, and the nucleotide sequences were compared with zebrafish genomic DNA sequences to identify exons, using blastn search at Ensembl genome server (http://asia.ensembl.org/Multi/Tools/Blast). Recombinant carp Tecrem (rcTecrem) transformant and mock transformant of CHO cells, carp leukocytes, and KF-1 cells were treated with appropriate first Ab and FITC-labeled anti-mouse IgG, and analyzed with Beckman Coulter Epics XL Flow Cytometer equipped with System II software (Beckman Coulter). Obtained histogram data files were analyzed with EXPO 32 MultiCOMP software (Beckman Coulter). A stable CHO cell line expressing rcTecrem (CHO-rcTecrem) was established as follows: cDNA encoding the cTecrem cDNA lacking putative signal peptides was amplified from the plasmid containing full-length cTecrem cDNA, using a sense primer with a 6×His tag-coding adapter and an antisense primer corresponding to the stop codon. A sequence encoding the cTecrem signal peptide was also PCR amplified. These cDNA segments were cloned into the sites BamHI and EcoRI of pcDNA 3.1 Myc/His A vector (Invitrogen). The recombinant plasmid and corresponding empty vector were separately introduced to CHO cells using Lipofectamin and Plus reagent (Invitrogen), and neomycin-resistant transformed cells were selected by culture in the presence of 0.4 mg/ml G418 (Invitrogen). where F stands for fluorescent intensity. The netrin domain (NTR)-encoding cDNA segments were amplified from respective full-length cDNA clones of carp C4-1 and C4-2 isotypes (39), using primers with adaptor sequences containing BamHI and SacI sites. The amplified product was subcloned into pCold-I vector and, after sequence confirmation, introduced to Origami B strain. Recombinant C4-1-NTR and C4-2-NTR of carp were expressed for 24 h at 15°C in the presence of 0.1 mM isopropyl β-D-thiogalactoside and purified from the culture supernatant by affinity chromatography on Ni-NTR–agarose columns, essentially following the manufacturer's instructions (Supplemental Fig. 1A). The purified rC4-1-NTR and rC4-2-NTR were emulsified in CFA and s.c. injected into rabbits, four times at weekly intervals. The rabbits were boosted and 1 wk later bled for separation of antiserum and purification of IgG on a HiTrap protein A column (GE Health Science, Tokyo, Japan). Anti-carp C4-1 and anti-carp C4-2 are monospecific and showed no cross-reactivity (Supplemental Fig. 1B, 1C). CHO and CHO-rcTecrem (1.0 × 107 cells) were harvested in PBS containing 10 mM EDTA (pH 7.4), resuspended in GGVB2+ or EDTA-GVB at 2.0 × 106 cells/ml, and incubated at 25°C for 30 min with 200 μl normal carp serum diluted 1/10–1/80 with GGVB2+ or EDTA-GVB. Each cell suspension was divided into two aliquots, which were incubated at room temperature for 30 min with 100 μl anti-carp C3 isotype mAb (5C7, 1 μg/ml; 3H11, 10 μg/ml) (40). The cells were then washed with PBS (pH 7.4) in an Ultrafree-MC centrifugal filter tube (Millipore), incubated with 120 μl 1/60-diluted anti-mouse IgG (whole molecule) F(ab′)2 fragment–FITC conjugate (Sigma-Aldrich), and analyzed by flow cytometry, as above. BALB/c mice were immunized four times at weekly intervals by i.p. injections of CHO-rcTecrem (1.0 × 107 cells) suspended in PBS, and, 2 d after a booster injection with the same dose, spleen cells harvested from the mice were fused with Sp2/O-Ag14 myeloma cells using PEG4000, following a standard method. Hybridomas grown in GIT medium containing hypoxanthine/aminopterin/thymidine supplements were screened by ELISA of the culture supernatants using microtiter plates coated with CHO-rcTecrem, CHO, and KF-1 cell lines. Hybridomas positive to both CHO-rcTecrem and KF-1, but negative to CHO, were chosen and cloned by the limit-dilution method. mAb was purified from the culture supernatant using HiTrap protein G (GE Health Science, Tokyo, Japan), according to the manufacturer's instructions. CHO-rcTecrem cells (2.0 × 107 cells) were lysed by sonication in 3 ml PBS containing 3.3% Triton X-100 and 1 mM PMSF on ice, and the lysate was cleared by centrifugation. The supernatant was, after absorption with 40 μl protein G-Sepharose, incubated with 16 μg anti-cTecrem mAb 1F12 at 4°C for 1 h. The immune complexes formed were trapped in 40 μl protein G-Sepharose, which were washed with 1% Nonidet P-40 in 10 mM Tris-HCl, 150 mM NaCl, 0.5 mM EDTA, and 10 mM NaF (pH 7.4), and boiled in 50 mM Tris-HCl, 2% SDS, 5% 2-ME, and 10% glycerol (pH 6.8) for SDS-PAGE analysis. Carp erythrocyte suspension (2 × 108 cells/ml) was incubated with 1/10-diluted anti-carp erythrocyte ginbuna crucian carp antiserum in RPMI 1640 at 25°C for 30 min and washed with RPMI 1640 three times. The sensitized carp erythrocyte suspension was incubated at 25°C for 30 min with 0.5 μg/ml anti-cTecrem mAb 1F12 in RPMI 1640 or with normal murine IgG1 as a control, washed twice with RPMI 1640, and then with normal carp serum (1/10 diluted in RPMI 1640) at 25°C for 60 min to activate the classical pathway of carp complement. The serum-treated carp erythrocytes were incubated with anti-carp C1q A-chain (41), anti-carp C3, anti-carp C4-1, and anti-carp C4-2 rabbit IgG (10 μg/ml) at 4°C for 30 min, and then with FITC-labeled anti-rabbit IgG (1/200 dilution), and analyzed by flow cytometry, as above. Our database search resulted in identification of two RCA-encoding loci essentially identical to those reported in the preceding paper. One of them, corresponding to a membrane protein previously named ZRC1, was subjected to cDNA cloning from zebrafish mixed organ mRNA. A full-length cDNA sequence (2281 bp) containing an open reading frame encoding 385 aa was cloned by using RACE PCR. The predicted primary structure specified a type I membrane protein composed of, from the N terminus, a signal peptide, five SCR modules, a short Ser/Pro-rich region, a transmembrane region, and a cytoplasmic domain (Fig. 1A), thus designated teleost complement-regulatory membrane protein (Tecrem). The translated product of zTecrem is different from that of previously reported ZRC1 in that zTecrem possesses a cytoplasmic domain sequence containing a few phosphorylation sites, whereas ZRC1 lacks the cytoplasmic domain (34). Nucleotide and deduced amino acid sequences of Tecrem from zebrafish (A) and carp (B). Asterisks indicate stop codons. The region encoding SCR modules, transmembrane (TM), and cytoplasmic region (CYR) is indicated by arrows. The putative phosphorylation sites for protein kinase C (PKC), casein kinase 2 (CK2), mitogen-activated kinase kinase (MAP2K), and G-coupled receptor kinase (GRK) are shaded. The polyadenylation signals are shown by italic and bold. The zTecrem amino acid sequence was used to search its carp homolog by TBLASTN program, gaining two expressed sequence tag fragments (EG649440 and CA964873) that share ∼50% amino acid sequence identity with zTecrem. On the basis of these nucleotide sequences, primers for 5′-, 3′-RACE PCR were designed, and a complete cDNA sequence (2341 bp) encoding 362 aa of cTecrem was isolated (Fig. 1B). The primary structure of cTecrem specifies a domain structure homologous to that of zTecrem, except that cTecrem has four SCR modules, followed by a region rich in Thr and Pro residues in the extracellular domains. Based on the overall domain architecture, zTecrem and cTecrem molecules are most similar to MCP/CD46, a type I membrane protein containing four SCR modules and a Ser/Thr/Pro-rich (STP) region, when compared with the human RCA homologs. On the result of RT-PCR, we found doublet bands in several tissues, suggesting that they are generated by alternative splicing of mRNA. To test the possibility, a cDNA region from SCR3 domain to 3′-UTR of zTecrem was amplified by RT-PCR with the primer set GSP2 and CSP3 and subcloned into pGEM-T vector, and randomly selected 24 clones were sequenced. As a result, cDNA inserts of four different lengths (823, 773, 916, and 866 bp) were obtained and designated splicing variants 1, 2, 3, and 4, respectively. Comparison of these nucleotide sequences with that of a zebrafish genomic DNA contig, NW_001878409, revealed an additional 93-bp exon encoding 31 aa rich in Ser/Thr/Pro, and the four types of alternative splicing variants differing in lengths of the STP region and cytoplasmic region were identified, as summarized in Fig. 2; zTecrem and ZRC1 (34) correspond to types 1 and 2, respectively. Generation of alternative splicing products of zTecrem. (A) Exon–intron organization of zTecrem gene. Closed and open rectangles show untranslated region and coding region, respectively. Exon and intron size are indicated by number on exon and between exons. Sequences of additional exons are shown below exon–intron organization. 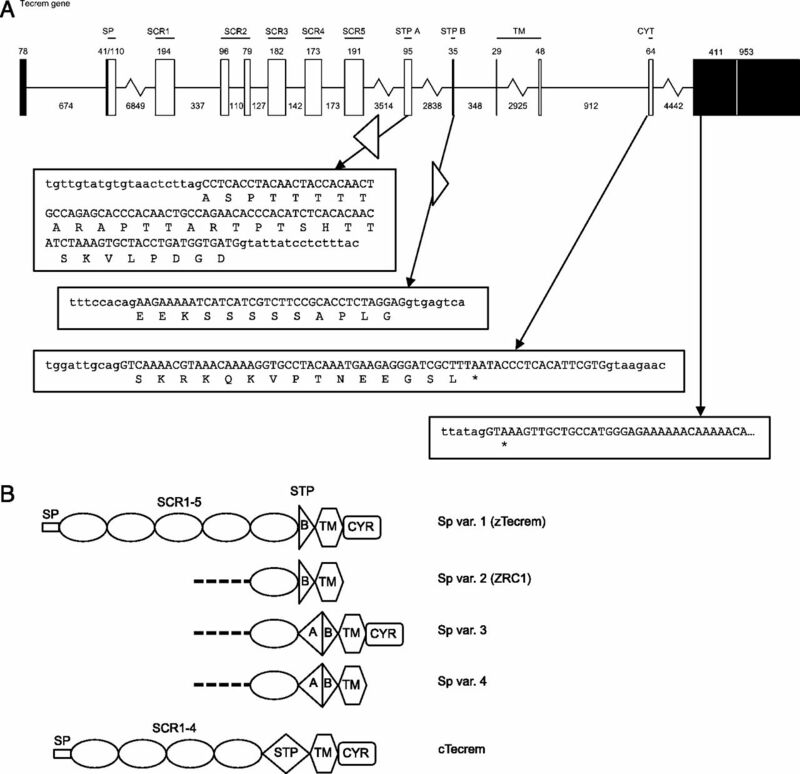 (B) Domain structures of zTecrem splicing variants (Sp var. 1–4) and cTecrem. CYR, cytoplasmic region; SP, signal peptide; TM, transmembrane region. Phylogenetic relationship of Tecrems with other RCA protein family members was assessed by drawing a neighbor-joining tree, as shown in Fig. 3. In fair agreement with a previous report, cTecrem and zTecrem form a tight cluster branched from a common ancestor of the group 2 genes of vertebrate RCA, suggesting that Tecrem may represent an ancestral form of group 2 RCA molecules, such as MCP/CD46, CR1/CD35, CR2/CD21, DAF/CD55, and C4bps. Phylogenetic tree of RCA proteins. Phylogenetic tree was constructed by neighbor-joining method using amino acid sequence of identified two kinds of Tecrem, factor H–like molecule, and RCA proteins (C4bp α-chain, C4bp β-chain, factor H, DAF/CD55, MCP/CD46, CR1/CD35, CR2/CD21, Crry, and Cremp) of higher vertebrates. Database accession numbers for sequences employed are as follows: human factor H, NP_000177; human factor H–related protein 1, NP_002104; human factor H–related protein 2, NP_005657; human factor H–related protein 3, NP_066303; human factor H–related protein 4, NP_006675; human factor H–related protein 5, NP_110414; rat factor H, NP_569093; mouse factor H, NP_034018; mouse factor H–related protein, AAA37416; cow factor H, NP_001029108; wild boar factor H, NP_999446; chicken factor H, XP_426613; Xenopus tropicalis factor H, NP_989218; barred sandbass sand bass cofactor protein, AAA92556; barred sandbass sand bass cofactor-related protein, CAA67355; rainbow trout factor H like, CAF25505; human coagulation factor XIII b subunit, NP_001985; rat coagulation factor XIII b subunit, NP_001099426; mouse coagulation factor XIII b subunit, BAE28851; cow coagulation factor XIII b subunit, NP_001033618; human C4-binding protein a chain, NP_000706; rat C4-binding protein a chain, NP_036648; mouse C4-binding protein, NP_031602; cow C4-binding protein a chain, NP_776677; guinea pig C4-binding protein a chain, BAB39739; chicken C4-binding protein a chain, NP_989995; human C4-binding protein b chain, NP_000707; rat C4-binding protein b chain, AAH88152; cow C4-binding protein b chain, NP_776678; human DAF, NP_000565; rat DAF, BAA88991; mouse DAF, NP_034146; cow DAF, NP_001025474; wild boar DAF, AAG14413; guinea pig DAF, BAA08398; human MCP, NP_002380; rat MCP, NP_062063; mouse MCP, NP_034908; cow MCP, NP_898903; wild boar MCP, NP_999053; rat crry, NP_062174; human complement receptor 1, NP_000564; human complement receptor 1 like, NP_783641; chicken complement-regulatory membrane protein, NP_001028815; human complement receptor 2, NP_001006659; rat, complement receptor 2,NP_001099459; mouse complement receptor 2, NP_031784: lamprey lamprey complement-regulatory protein, BAC77070. We have examined a possibility of having multiple Tecrem genes in carp genome, because carp is known as a pseudotetraploid species (42, 43), probably generated by allotetraploidization. Thus, copy number of Tecrem gene was analyzed by Southern hybridization and PCR analysis of carp genome DNA. Genomic Southern hybridization with a 352-bp digoxigenin-labeled probe covering entire SCR3 and SCR4 gave three bands with approximate size of 16, 12, and 9 kbp (Supplemental Fig. 2A). In contrast, a genomic DNA segment corresponding to the third and fourth SCR was PCR amplified using primers 11 and 12 (Table I) and subcloned into pGEM-T vector. Sequencing of 12 clones, randomly selected, resulted in identification of three distinct sequences, designated types A, B, and C (Supplemental Fig. 2B). The appearance of three hybridization bands and three different Tecrem genomic sequences strongly suggests the presence of at least two copies of Tecrem genes in carp genome. A hybridoma clone, 1F12, producing IgG1 reactive to CHO-rcTecrem and KF-1, but not to CHO-mock, was established (Fig. 4A). Specificity of 1F12 was assessed by ELISA and immunoprecipitation of the Ag from CHO-rcTecrem. As shown in Fig. 4B, 1F12 trapped a 66-kDa polypeptide that was also recognized by anti-6×His tag. Difference in the observed molecular mass and theoretical value (37.6 kDa) of rcTecrem (including 6×His tag, but excluding the signal peptide) suggests that the mature rcTecrem protein expressed on CHO cell is heavily O-glycosylated at the STP-like region, as reported for mammalian CD46 (44). Specificity of anti-cTecrem mAb (1F12) and detection of cTecrem protein on blood cells. (A) Schematic representation of rcTecrem protein with a 6×His tag. (B) ELISA using anti-cTecrem mAb (1F12). CHO, CHO-rcTecrem, and KF-1 cells were cultured in 96-well plate. After culture, each cell was fixed and used for ELISA using anti-cTecrem mAb (1F12). (C) Immunoprecipitation using anti-cTecrem mAb 1F12. CHO-rcTecrem cells were lysed in PBS containing 3.3% of Triton X-100 and 1 mM PMSF. Supernatant of lysate was incubated with anti-cTecrem mAb 1F12. 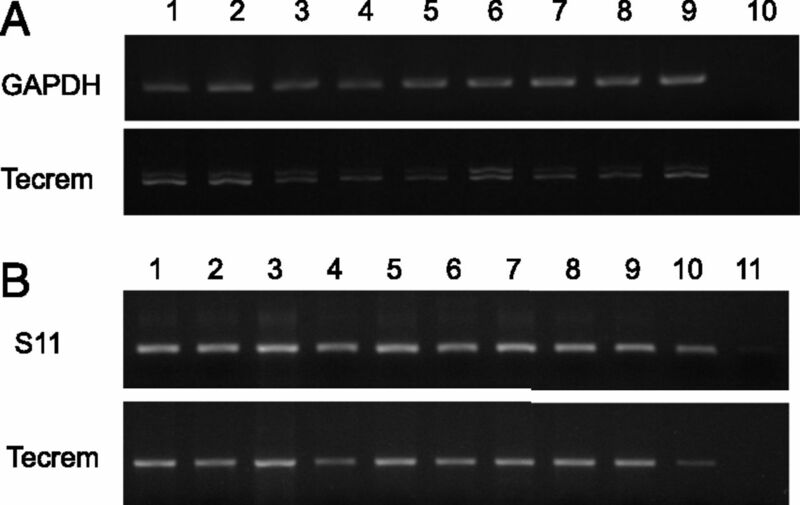 Proteins trapped by protein G-Sepharose were electrophoresed on 10% polyacrylamide gel. After electrophoresis, gel was stained by Coomassie brilliant blue R-250 (left panel) or used for Western blotting using anti-6×His tag mAb (right panel). Molecular masses of detected proteins are shown between left and right panels. Ig H and Ig L denote H and L chains, respectively, of mouse Ig. (D) Flow cytometric detection of cTecrem protein on the surface of blood cells. Leukocytes and erythrocytes from carp peripheral blood were treated with anti-cTecrem mAb (1F12), followed by FITC-labeled second Ab treatment, and subjected to flow cytometry. Gray peaks represent negative control samples without anti-cTecrem mAb. Expression of Tecrem protein on carp blood cells was examined by flow cytometry using 1F12 mAb. As shown in Fig. 4C and 4D, all the erythrocytes and leukocytes from peripheral blood and leukocytes from the kidney carry Tecrem on their surfaces with no significant population of Tecrem-negative cells. Tecrem expression in various tissues of zebrafish and carp was investigated by RT-PCR. As a result, Tecrem mRNA was detected from all the tissues examined, suggesting that Tecrem is expressed ubiquitously in both species (Fig. 5). Doublet bands of zTecrem were detected in several tissues, probably representing the alternatively spliced variants. Expression of Tecrem transcripts in zebrafish and carp tissues. (A) zTecrem expression analyzed by RT-PCR. GAPDH was used as positive control. Lane 1, kidney; lane 2, spleen; lane 3, hepatopancreas; lane 4, heart; lane 5, brain; lane 6, intestine; lane 7, gill; lane 8, muscle; lane 9, skin; lane 10, no template control. (B) cTecrem expression detected by RT-PCR. The 40S rRNA S11 was used as a positive control. Lane 1, head kidney; lane 2, body kidney; lane 3, spleen; lane 4, hepatopancreas; lane 5, heart; lane 6, brain; lane 7, intestine; lane 8, gill; lane 9, skin; lane 10, PBLs; lane 11, no template control. Five zebrafish and three carp individuals were independently analyzed, and representative data are shown. Predicted complement-regulatory function of Tecrem was examined using a cytolytic reaction by carp complement. Calcein-labeled CHO cells were sensitized with carp Abs and attacked by normal carp serum mainly via the Ab-dependent classical pathway. Flow cytometry of rcTecrem trasformants using anti-His tag Ab showed that >70% of cells were rcTecrem positive, whereas there is a substantial variation in the expression level (Fig. 6A). 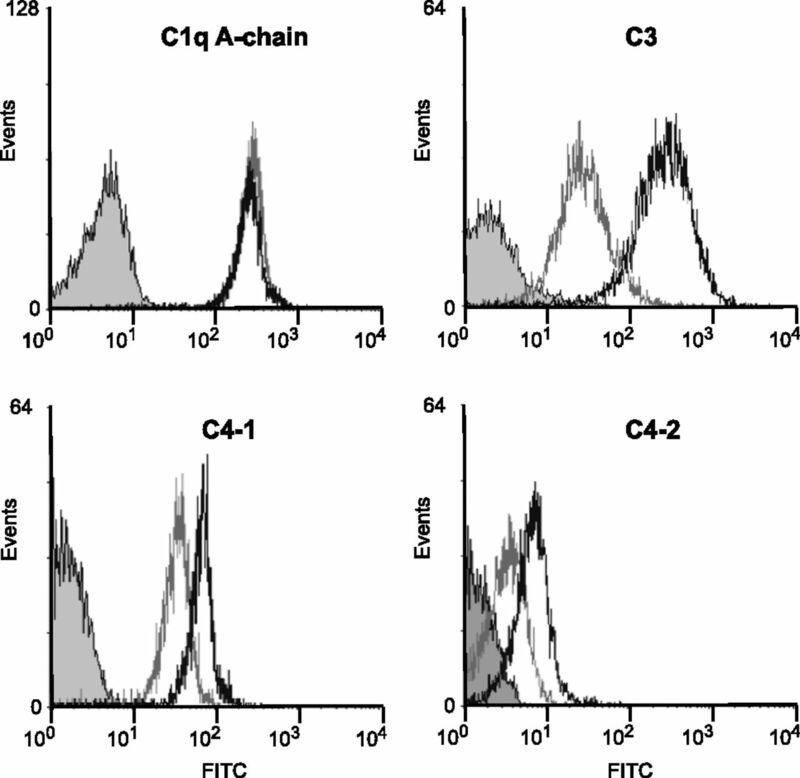 Complement-inhibitory activities of cTecrem assayed using CHO cells expressing rcTecrem. (A) Surface expression of rcTecrem on the recombinant CHO cells revealed by flow cytometry. 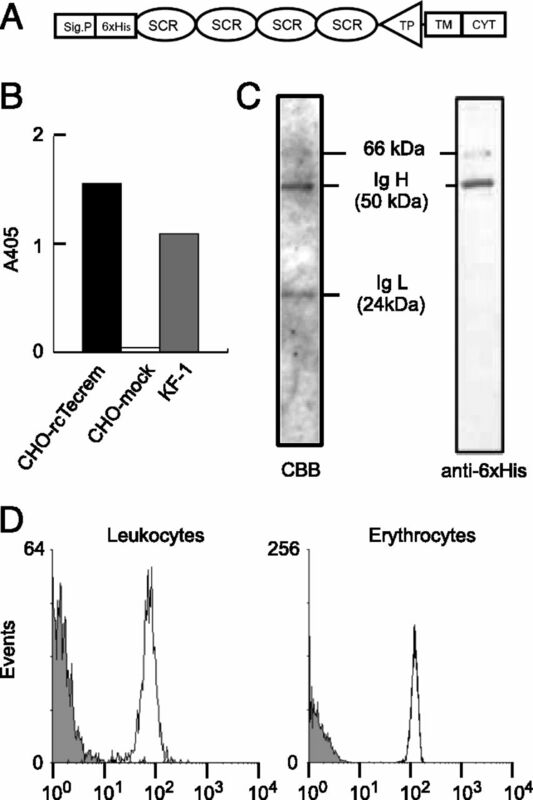 CHO-rcTecrem and its mock transfectant (CHO-mock) were treated with anti-6×His FITC-labeled Ab and analyzed by flow cytometry. Gray and black dotted lines show negative controls without anti-6×His of CHO-rcTecrem and CHO-mock, respectively. Gray-filled peak indicates CHO-mock with anti-6×His, showing a nonspecific signal of anti-6×His. Solid black line shows CHO-rcTecrem stained with anti-6×His. (B) Inhibition of cytotoxicity by carp complement against CHO cells by rcTecrem. CHO-rcTecrem and CHO-mock sensitized with carp anti-CHO were incubated with 1/8-diluted normal carp serum in GGVB2+ at 25°C for 1 h to allow the classical pathway activation, and their cytotoxicity was measured by the calcein-release assay. The experiment was performed in quadruplicate, and the results are represented as mean ± SD (p < 0.05, Student t test). (C) Suppression of C3 deposition by rcTecrem on CHO cells. CHO-rcTecrem and CHO-mock were attacked by carp complement, as above, but at noncytolytic concentration (1/80 dilution) at 25°C for 30 min. The cells were treated with 1 μg/ml anti-carp C3-S mAb (5C7) and with FITC-labeled second Ab, and then analyzed by flow cytometry to measure degree of C3 deposition. Gray-filled peak is a negative control without anti–C3-S. Gray and black lines show CHO-rcTecrem and CHO-mock, respectively, indicating a significant inhibition of C3 deposition onto CHO-rcTecrem. Inhibitory effect of Tecrem on complement-mediated cytolysis was assessed by calcein-release assay using CHO-rcTecrem and CHO mock sensitized with anti-CHO carp Ab. As shown in Fig. 6B, CHO-rcTecrem showed significantly lower level of cytolysis by carp complement than that of mock-control cells, suggesting that Tecrem negatively regulates complement activation. In the C3-deposition assay, incubation of normal carp serum led to deposition C3-S isotype on the target cells, and this binding was substantially lower on Tecrem transformant than on mock control, indicating that Tecrem downregulates deposition of C3-S isotype (Fig. 6C). This assay system did not work for C3-H1, another major isotype of carp C3, because C3-H1 did not show any significant binding to CHO under the conditions that allowed complement activation (data not shown). Regulation of C3 and C4 deposition by Tecrem on autologous cells was assayed using carp erythrocytes sensitized with antiserum raised in ginbuna crucian carp, a close relative of the common carp. As shown in Fig. 7, the ginbuna crucian carp IgM was capable of triggering the classical pathway of carp complement on carp erythrocytes, as evidenced by binding of C1q A-chain, which was not affected by treatment with anti-cTecrem mAb. Deposition of C3 and the two C4 isotypes, C4-1 and C4-2, was also detected on the sensitized carp erythrocytes, and they were increased by treatment with anti-cTecrem, suggesting that Tecrem plays a role in restriction of C3 and C4 deposition on autologous cells. Effect of anti-cTecrem mAb on the deposition of carp C1q, C3, C4-1, and C4-2 to autologous erythrocytes. Carp erythrocytes sensitized with antiserum raised in ginbuna crucian carp were treated with anti-cTecrem mAb (1F12) or with control IgG and then incubated with normal carp serum to allow activation of the classical complement pathway. Deposition of C1q, C3, C4-1, and C4-2 on the sensitized and complement-activated carp erythrocytes was analyzed by flow cytometry. Gray-filled peak is a negative control without the first Ab. Black and gray lines show carp erythrocytes treated with anti-cTecrem mAb and with control IgG, respectively. Our attempts to discover membrane-bound types of RCA protein have been conducted on zebrafish independently from the group that published recently two RCA molecules (ZRC1 and ZRC2), both of which belong to group 2 of RCA family (34). We have tentatively named the membrane-bound RCA as Tecrem and found that zTecrem and ZRC1 are transcripts from the same gene. We have also cloned its carp homolog for further phylogenetic and functional studies and revealed that cTecrem is closely similar to zTecrem, but differs in the domain structure such as number of SCR modules (4 in carp, 5 in zebrafish). The diversity in the number of SCR modules is common in the member of RCA family (45, 46), and a minimum functional unit as a binding site usually spans only a single or two SCR modules (47–55). Thus, it seems unlikely that the difference in the number of SCR modules would significantly affect functions of Tecrem between the two species. We found four types of splicing variants of zTecrem that differ in the serine/threonine-rich and the cytoplasmic regions. cTecrem, which contained a 49-aa residues-long threonine/proline-rich region and cytoplasmic region, resembled splicing variant 3 of zTecrem in molecular architecture (Fig. 2B). It is intriguing to note that human MCP/CD46 gene also produces very similar alternative splicing variants differing in the STP-rich region and the cytoplasmic region (56), implying tight evolutionary conservation of this type of splicing variant. In the phylogenetic tree analysis, Tecrem branches from the root of group 2 RCA molecules, which diverge to mammalian MCP/CD46, DAF/CD55, CR1/CD35, CR2/CD21, and C4bp subunits. In addition, whereas tetrapod vertebrates such as frogs, birds, and mammals possess both MCP/CD46-like type I membrane protein RCAs and GPI-anchored RCAs, there is no indication for the existence of a GPI-anchored RCA in teleost. Taken together, it is conceivable that Tecrem represents an ancestral form of membrane-bound group 2 RCA molecules. Identification of membrane-bound RCA in more primitive animals such as agnathans and invertebrates would draw more convincing conclusion. More interestingly from a functional point of view, number of potential O-glycosylation sites seen on serine/threonine-rich regions on zTecrem splicing variants and their potency were different among splicing variants (Supplemental Fig. 3). The difference seen on the threonine/proline-rich region may have a functional effect on the Tecrem molecule, because in mammalian MCP/CD46, O-glycosylation in the STP region controls its protein expression and complement-regulatory function (44, 55). In this regard, it should be noted that these splicing variants contained different length and potential O-glycosylation sites of threonine/proline-rich regions and may cause functional divergence of Tecrem. In mammals, membrane-bound RCA proteins can be categorized into two groups: regulators of complement activation by cofactor (MCP/CD46) or decay acceleration (DAF/CD55) and complement receptors to recognize C3-tagged Ag (CR1/CD35 and CR2/CD21) (1, 2). The wide tissue and cellular distribution of Tecrem shown in the current study suggest its role as complement regulator rather than complement receptor, of which expression would be limited to phagocytes and other immune cells. Confirming the above assumptions, inhibitory activity of Tecrem on complement activation was observed at the protein level through the experiments using two different assay models, as follows: one employing rcTecrem and another utilizing autologous complement activation system. In the latter system, anti-carp erythrocyte Ab raised in a closely related fish species successfully triggered the classical activation cascade of carp complement on the carp cells, and it was demonstrated that anti-cTecrem mAb allowed more deposition of carp C3 and two C4 isotypes on the autologous cells by inhibiting the regulatory function of Tecrem. It is unclear which C3 isotypes were bound to carp erythrocytes, because the anti-carp C3 used in this work was polyclonal Ab reactive to all the C3 isotypes (57). Taken together, the present results suggest Tecrem can restrict C3 deposition on the host cell, thereby preventing host cell damage by complement-mediated cytotoxicity. It remains to be analyzed whether the mode of inhibitory action of Tecrem is decay acceleration of C3 convertase or C3b degradation as a cofactor for factor I. We have cloned two isotypes of complement factor I from carp (58), and are now making their recombinant proteins, which will be useful for functional analysis to examine detailed inhibitory mechanism of Tecrem. Teleost fish including carp, zebrafish, and trout possess divergent isotypes of C3 differing in binding spectrum to various targets (40, 57, 59). It is particularly interesting to examine how the activation of different C3 isotypes is regulated by RCA. Preceding studies on comprehensive search of zebrafish RCA genes have revealed only ZRC1 as a single gene that encodes membrane-bound RCA protein, suggesting that a Tecrem has a versatile regulatory ability to different C3 isoforms in a single teleost species. In the case of carp, a pseudotetraploid species, our data suggest the presence of duplicated genes of Tecrem, possibly encoding two distinct Tecrem proteins with different inhibition spectra against the diversified C3 isotypes. In these contexts, it is interesting to point out that pig DAF fails to act on human C3b, which shares 76% amino acid identity with pig C3b, resulting in complement-mediated hyperacute damage of porcine organ transplant in human serum (60, 61). In a single teleost species, such as trout and carp, C3 isoforms are as divergent as seen between human and pig, sharing 75–82% identity. If such diverged C3 isoforms can be regulated by a single kind of RCA protein, the inhibitory mechanism would be intriguing to analyze to better understand evolutionary and functional significance of C3 diversity. Molecular anatomy to identify functional domains essential for the complement regulation is also an issue to be addressed. In barred sand bass, a factor H–like soluble RCA has been reported to show a cofactor activity in factor I–mediated degradation of both human C3b and C4b (30). It would be interesting to analyze whether Tecrem can regulate both C3b and C4b, and, if yes, which modules are responsible for the regulation, to gain evolutionary implication of this protein family through vertebrate lineage. Mammalian MCP/CD46 has also been reported to have immunomodulatory functions in adaptive immune response. Interaction of C3b with MCP/CD46 expressed on T cells and macrophages has been shown to modify adaptive immune response by controlling T cell activation and inactivation (16–18, 62, 63). The MCP/CD46-like molecular architecture of Tecrem and the presence of motifs for cell signaling, such as putative phosphorylation sites by protein kinase C, MAPK kinase, and casein kinase 2, in its cytoplasmic domain, lead us to hypothesize that Tecrem may also play an important role in linking innate immunity and adaptive immune response in teleost, especially in balancing Th1/Th2 responses. We have cloned orthologs of Tecrem from ginbuna crucian carp, a close species of carp, in which purified B cells and CD4- and CD8-positive T cells can be used for analysis of adaptive immune responses (64). Evolutionary conservation of the modulation of adaptive immune response by CD46-like molecules will be explored using the ginbuna crucian carp model. We thank Prof. Hirofumi Tachibana (Department of Bioscience and Biotechnology, Kyushu University) for providing CHO cells and Dr. Yasutoshi Yoshiura (National Institute of Aquaculture) for supplying zebrafish. This work was supported in part by Japan Society for the Promotion of Science KAKENHI Grant 22380111 (to M.N.). The sequences presented in this article have been submitted to the DNA Data Base in Japan/European Molecular Biology Laboratory/GenBank (http://www.ncbi.nlm.nih.gov/genbank) under the following accession numbers: zTecrem, AB723859 and cTecrem, AB723858. 2001. Complement: first of two parts. N. Engl. J. Med. 344: 1058–1066. 1991. Biology of complement: the overture. Immunol. Today 12: 291–295.
. 1983. Affected erythrocytes of patients with paroxysmal nocturnal hemoglobinuria are deficient in the complement regulatory protein, decay accelerating factor. Proc. Natl. Acad. Sci. USA 80: 5066–5070.
. 2003. Familial haemolytic uraemic syndrome and an MCP mutation. Lancet 362: 1542–1547.
. 2008. Factor H autoantibodies in atypical hemolytic uremic syndrome correlate with CFHR1/CFHR3 deficiency. Blood 111: 1512–1514.
. 1991. Three-dimensional structure of a complement control protein module in solution. J. Mol. Biol. 219: 717–725.
. 1999. Complement Regulatory Proteins. Academic Press, San Diego, CA. 2004. Complement: a unique innate immune sensor for danger signals. Mol. Immunol. 41: 1089–1098. 1980. Identification of the membrane glycoprotein that is the C3b receptor of the human erythrocyte, polymorphonuclear leukocyte, B lymphocyte, and monocyte. J. Exp. Med. 152: 20–30. 1953. The immune-adherence phenomenon; an immunologically specific reaction between microorganisms and erythrocytes leading to enhanced phagocytosis. Science 118: 733–737.
. 2010. Complement receptor 1 expression on mouse erythrocytes mediates clearance of Streptococcus pneumoniae by immune adherence. Infect. Immun. 78: 3129–3135.
. 1992. CD19: lowering the threshold for antigen receptor stimulation of B lymphocytes. Science 256: 105–107.
. 2002. Complement component C3 promotes T-cell priming and lung migration to control acute influenza virus infection. Nat. Med. 8: 373–378. 2004. The complement system in regulation of adaptive immunity. Nat. Immunol. 5: 981–986.
. 2009. CD46-induced human Treg enhance B-cell responses. Eur. J. Immunol. 39: 3097–3109.
. 2010. Complement regulator CD46 temporally regulates cytokine production by conventional and unconventional T cells. Nat. Immunol. 11: 862–871.
. 2011. CD46 in innate and adaptive immunity: an update. Clin. Exp. Immunol. 164: 301–311.
. 2000. Evolutionary relationships among proteins encoded by the regulator of complement activation gene cluster. Mol. Biol. Evol. 17: 1718–1730.
. 1985. Identification of an additional class of C3-binding membrane proteins of human peripheral blood leukocytes and cell lines. Proc. Natl. Acad. Sci. USA 82: 859–863.
. 1988. Organization of the genes encoding complement receptors type 1 and 2, decay-accelerating factor, and C4-binding protein in the RCA locus on human chromosome 1. J. Exp. Med. 167: 1271–1280.
. 1998. Ancient origin of human complement factor H. J. Mol. Evol. 47: 625–630.
. 1989. Genetic organization of complement receptor-related genes in the mouse. J. Exp. Med. 169: 1479–1484.
. 1992. The evolution of mouse and human complement C3-binding proteins: divergence of form but conservation of function. Immunol. Today 13: 231–236.
. 2001. A novel chicken membrane-associated complement regulatory protein: molecular cloning and functional characterization. J. Immunol. 166: 424–431.
. 2005. Regulator of complement activation (RCA) locus in chicken: identification of chicken RCA gene cluster and functional RCA proteins. J. Immunol. 175: 1724–1734.
. 2009. Regulator of complement activation (RCA) gene cluster in Xenopus tropicalis. Immunogenetics 61: 371–384.
. 1994. Cloning and characterization of a cDNA representing a putative complement-regulatory plasma protein from barred sand bass (Parablax neblifer). Biochem. J. 301: 391–397.
. 1996. Cloning and recombinant expression of a barred sand bass (Paralabrax nebulifer) cDNA: the encoded protein displays structural homology and immunological crossreactivity to human complement/cofactor related plasma proteins. Dev. Comp. Immunol. 20: 407–416.
. 1998. The complement cofactor protein (SBP1) from the barred sand bass (Paralabrax nebulifer) mediates overlapping regulatory activities of both human C4b binding protein and factor H. J. Biol. Chem. 273: 19398–19404.
. 1998. 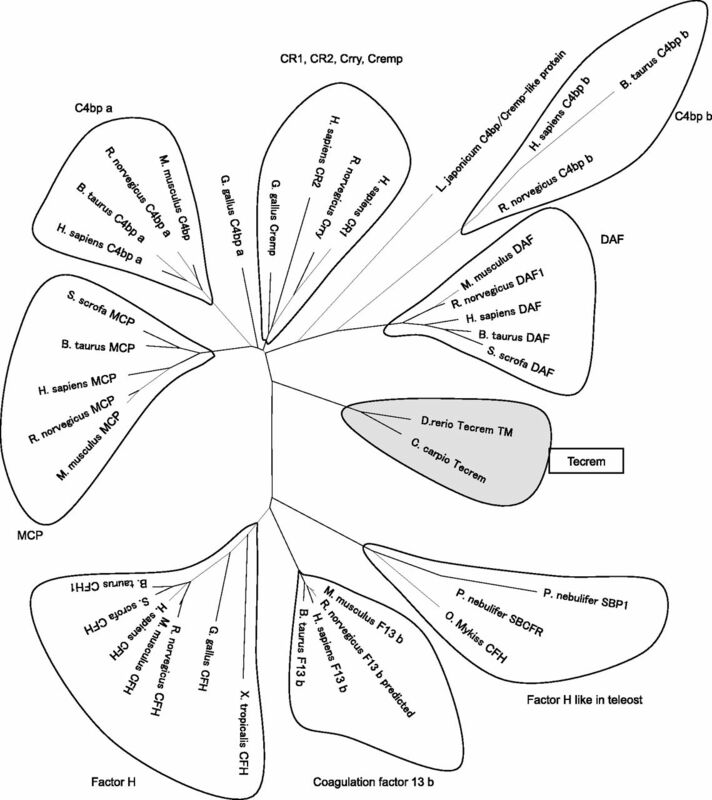 Molecular analysis of complement regulatory cDNA composed of 12 tandem SCRs from the Japanese flounder. Fish Pathol. 33: 351–355.
. 1998. 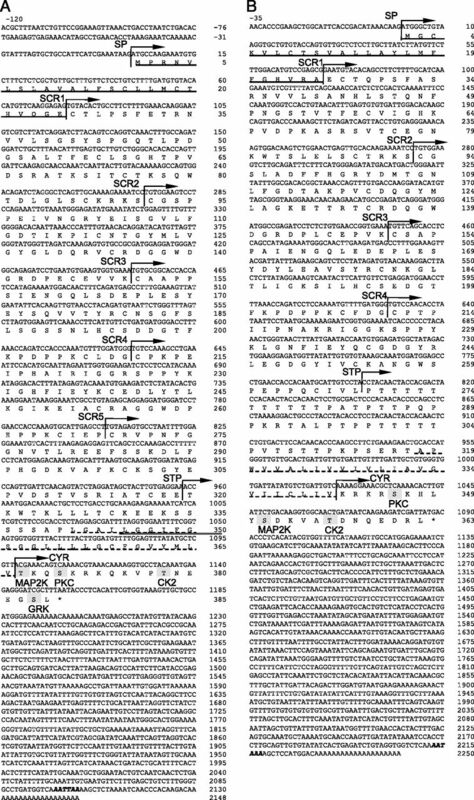 Molecular analysis of complement regulatory protein-like cDNA from the Japanese flounder Paralichthys olivaceus. Fish. Sci. 64: 140–143.
. 2010. Zebrafish complement factor H and its related genes: identification, evolution, and expression. Funct. Integr. Genomics 10: 577–587.
. 2012. Regulator of complement activation (RCA) group 2 gene cluster in zebrafish: identification, expression, and evolution. Funct. Integr. Genomics 12: 367–377.
. 2004. A short consensus repeat-containing complement regulatory protein of lamprey that participates in cleavage of lamprey complement 3. J. Immunol. 173: 1118–1128.
. 1994. Isolation of a carp complement protein homologous to mammalian factor D. Mol. Immunol. 31: 337–342.
. 2013. Identification of anti-viral cytotoxic effector cells in the ginbuna crucian carp, Carassius auratus langsdorfii. Dev. Comp. Immunol. 39: 370–377.
. 1998. Two diverged complement factor B/C2-like cDNA sequences from a teleost, the common carp (Cyprinus carpio). J. Immunol. 161: 4811–4818.
. 2005. Two divergent isotypes of the fourth complement component from a bony fish, the common carp (Cyprinus carpio). J. Immunol. 175: 4508–4517.
. 2012. The binding spectra of carp C3 isotypes against natural targets independent of the binding specificity of their thioester. Dev. Comp. Immunol. 38: 10–16.
. 2010. Trypanosoma carassii calreticulin binds host complement component C1q and inhibits classical complement pathway-mediated lysis. Dev. Comp. Immunol. 34: 396–405.
. 1967. Diploid-tetraploid relationship among old-world members of the fish family Cyprinidae. Chromosoma 23: 1–9.
. 1968. Evolution from fish to mammals by gene duplication. Hereditas 59: 169–187.
. 1998. Membrane cofactor protein: importance of N- and O-glycosylation for complement regulatory function. J. Immunol. 161: 3711–3718. 1990. Comparative structure and evolution of murine CR2: the homolog of the human C3d/EBV receptor (CD21). J. Immunol. 144: 3458–3467.
. 1989. Identification of murine complement receptor type 2. Proc. Natl. Acad. Sci. USA 86: 242–246.
. 1995. Identification of complement regulatory domains in human factor H. J. Immunol. 155: 348–356.
. 2008. A new map of glycosaminoglycan and C3b binding sites on factor H. J. Immunol. 181: 2610–2619.
. 2001. Structural requirements for the complement regulatory activities of C4BP. J. Biol. Chem. 276: 27136–27144.
. 1991. Contribution of the repeating domains of membrane cofactor protein (CD46) of the complement system to ligand binding and cofactor activity. J. Immunol. 147: 3005–3011.
. 1995. Diversity of sites for measles virus binding and for inactivation of complement C3b and C4b on membrane cofactor protein CD46. J. Biol. Chem. 270: 15148–15152.
. 1996. Localization of classical and alternative pathway regulatory activity within the decay-accelerating factor. J. Immunol. 156: 2528–2533.
. 1999. Structure-activity relationships within the N-terminal short consensus repeats (SCR) of human CR1 (C3b/C4b receptor, CD35): SCR 3 plays a critical role in inhibition of the classical and alternative pathways of complement activation. Eur. J. Immunol. 29: 1955–1965.
. 1999. Decay accelerating activity of complement receptor type 1 (CD35): two active sites are required for dissociating C5 convertases. J. Biol. Chem. 274: 31160–31168.
. 1992. Tissue-specific and allelic expression of the complement regulator CD46 is controlled by alternative splicing. Eur. J. Immunol. 22: 1513–1518.
. 1991. Alternatively spliced RNAs encode several isoforms of CD46 (MCP), a regulator of complement activation. Immunogenetics 33: 335–344.
. 2000. Molecular cloning and protein analysis of divergent forms of the complement component C3 from a bony fish, the common carp (Cyprinus carpio): presence of variants lacking the catalytic histidine. Eur. J. Immunol. 30: 858–866.
. 2003. Molecular cloning of the complement regulatory factor I isotypes from the common carp (Cyprinus carpio). Immunogenetics 54: 801–806.
. 1998. Complement diversity: a mechanism for generating immune diversity? Immunol. Today 19: 519–523.
. 1991. Inhibition of complement-mediated endothelial cell cytotoxicity by decay-accelerating factor: potential for prevention of xenograft hyperacute rejection. Transplantation 52: 530–533.
. 1998. Xenogeneic transplantation. Annu. Rev. Immunol. 16: 433–470.
. 2012. Novel roles of complement in T effector cell regulation. Immunobiology 217: 216–224.
. 2005. T-cell stimulation and regulation: with complements from CD46. Immunol. Res. 32: 31–43.
. 2013. Molecular characterization and expression analysis of three membrane-bound complement regulatory protein isoforms in the ginbuna crucian carp Carassius auratus langsdorfii. Fish Shellfish Immunol. 35: 1333–1337.